I had the pleasure of coordinating an engagement party for a realllllly cute couple this past weekend. They've been together since they were 14, and they're now full on grown ups in their 20s. how cute is that!! 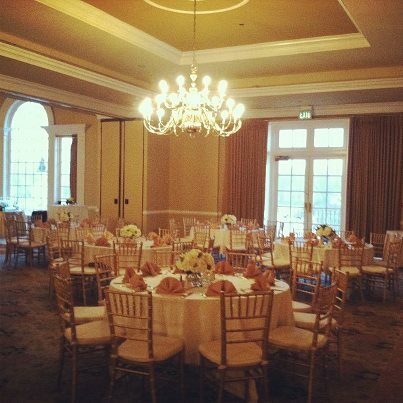 The engagement party was a classy affair held at the beautiful Providence Country Club. You may remember Providence Country Club from Alley and Mark's beautiful October wedding last year. I can't say enough good things about Providence and their staff. Good food, wonderful staff and a beautiful space. They hit it out of the park every time. I apologize for the non-professional quality photos; they are all from my trusty I-Phone and Instagram. 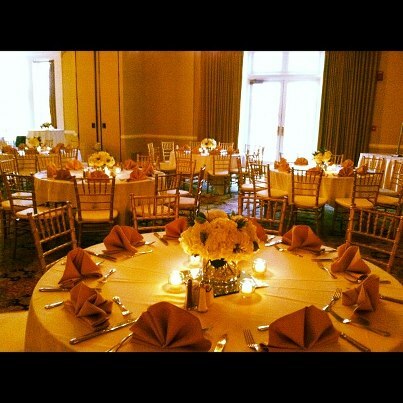 Providence set up a beautiful room in pretty neutrals. Gold chivari chairs, ivory tablecloths and sandalwood napkins were complimented by white hydrangeas by the the fab Pink Petunia Designs and were accented by votive candles. Side note, I want this chandelier for my house...too bad it's probably the size of my living room. 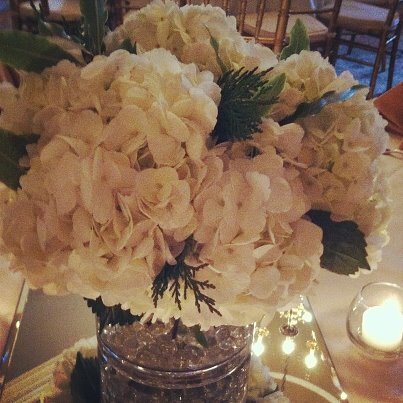 The white hydrangeas were complemented with various types of greenery. It was beautiful! Smaller arrangements were put on the cocktail tables. We had a nice outdoor setup on the veranda looking over the golf course, but unfortunately it was freezing and literally hailing. Weirdest weather ever here lately. We displayed a timeline of photos from the couple's long relationship on the grand piano. They make a cute couple, even at 14! I also want to thank Brian at Z Brothers DJ for providing killer tunes so the guests could dance the night away. The evening was a perfect celebration for a sweet couple. Congrats to Brendan and Carrie! What a beautiful party! I can't believe my sister's engagement party was just a year ago! What an amazing way to set the tone for the wedding. The cake alone has set the bar pretty darn high! great venue! and the gold chairs are to die for!